On the face of it, the goal of logistics operates from a fairly simple premise – get something from one place to another as quickly and cheaply as possible. Do that well, the thinking goes, and success will follow. Then, around the beginning of this century, the consumer became more of a driving force. Instead of logistics companies offering improved processes based on their version of the slow-but-sure evolution of the industry, the consumer began to take a greater interest in what logistics companies can and should do. To be sure, there are futuristic examples of better supply chain management making headlines that many believe will be in place soon. We are now living in a time where space has become more commercialized, with the real prospect of packages being sent by rocket in low earth orbit across the planet in just minutes. According to The Economist, bank powerhouse Morgan Stanley projects that the space industry will grow from $350 billion in 2016 to $1.1 trillion by 2040, powered in part by logistics. Back on earth, this wonderful logistics future seems too far away to contemplate. Some logistics companies are still dragging their feet in what has historically been a stodgy industry (think rail and trucking) to truly get involved in what the industry can and will be doing, as more and more data analytics about getting a product from point A to point B helps logistics be more reliable, and more in line, with an enlightened consumer demands. Things have changed, and foot-dragging is failure. Darin Cooprider, the vice president and general manager of consumer packaged goods at Ryder, a Purdue graduate who attended the Supply Chain Strategy Program at the Massachusetts Institute of Technology, says that 30 years ago, there were no schools that were really granting degrees on supply chains or logistics as a discipline. “A lot of people got into this logistics business by accident,” Cooprider says. For some leading retail companies – Amazon, Apple, Whole Foods, Walmart and others – business survival depends on, and to a certain extent, is led by their logistics operations. The real issue is how supply chain management has become more of a focus for all management professionals. But there are industries where managers lag in adopting best practices. For example, supply chain management is the second largest expense for health care providers, an industry notoriously slow to adopt management technologies, according to a 2015 national survey conducted by healthcare data provider SERMO Intelligence. In fact, 85 percent of respondents surveyed said their health systems are currently working to identify or implement new ways to reduce supply chain waste and related costs. The survey also showed that the primary obstacles to improving supply chain management include the lack of a full, end-to-end view of the supply chain from manufacturer to patient, and low awareness of current technology, such as automated solutions that utilize high-frequency radio frequency identification (RFID) tags. According to the survey, only 15 percent of hospital decision makers “strongly agree” that they have a sufficiently broad view of their supply chain. Even in a world where transportation logistics have become more streamlined, building a logistics operation based on geography continues to play a critical role. One example is Liberty County on the southeast Georgia coast, which is home to 13 manufacturing companies and five distribution hubs exporting to over 70 countries. Distribution companies are located on one of two business parks, Tradeport East Business Center and Tradeport West Business Center. 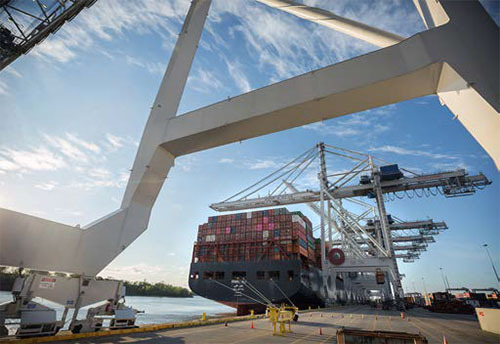 Both the 1,843-acre Tradeport East and the 1,249-acre Tradeport West business centers (which is still under development) are strategically located just 30 minutes from the Port of Savannah. Target has a 1.5 million square foot regional distribution center, and Tire Rack has a 242,000 square foot distribution center, both in Tradeport East. Tire Rack located at the park because they could ship via UPS or Fed Ex into Miami overnight. “That was essential to making their decision to locate in the park,” Carmen Cole, director of administration and finance for Liberty County Development Authority, says. A little over 300 miles down the east coast from Liberty County is Indian River County, Florida, home to a 400,000-square-foot CVS distribution center located in the 145-acre Indian River Industrial Park along I-95 with good access to the Tampa Bay market. There are 90 site-ready acres available for development in the park. While both those areas offer coastal distribution settings with access to the largest population centers in the country via mostly highways or waterways, there are also distribution areas in the center of the country that offer more legacy distribution operations assets based mostly on a large infrastructure of truck and rail services. 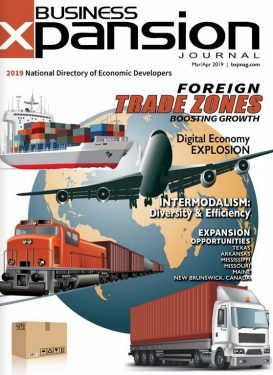 Burlington Northern Santa Fe (BNSF) and Union Pacific have a large presence in the Topeka area, according to Molly Howey, senior vice president of economic development for GoTopeka, the area’s economic growth development organization. BNSF Railway is one of the area’s largest employers, according to the Topeka Chamber of Commerce, and is also one of North America’s leading freight transportation companies, composed of a rail network of 32,500 miles across 28 states and three Canadian provinces. Topeka has distribution centers in the area for Home Depot (the 465,000-square-foot Home Depot Rapid Deployment Center that opened in 2010) and Target (a 1,350,000 square foot regional distribution center that opened in 2004). Frito-Lay has their number three manufacturing center in the area, and there is a Goodyear Tire and Rubber Company plant in the area as well, both with large distribution components to them. “There is a cluster of food manufacturers here in the area, all with a major distribution components,” Howey says. Topeka also has a large 12,900-foot runway at Forbes Field, big enough for any sized aircraft. The city is located in the center of the U.S. on the crossroads of I-70 and highway 75 with the ability to reach 90 percent of U.S. market within 2 days. “Those are the main pieces and parts of the assets for the logistics and distribution industry,” Howey says. BY STEVEN J. KING, P.E. Quonset Business Park is the leader of job creation and economic development in Rhode Island. Over 200 companies who call Quonset home rely on our convenient access to I-95, a freight rail service that operates throughout the park, and easy access to the Port of Davisville, Rhode Island’s only public port and a gateway to markets throughout Southern New England and beyond. Quonset delivers a comprehensive experience for businesses in the park that includes these business logistics, as well as retail and recreational offerings. Advantageously located between Boston and New York, the Quonset Business Park has world-class infrastructure and is rich in amenities, location and history. Located on Rhode Island’s Narragansett Bay, the Park boasts close proximity to major airports including, T.F. Green (Rhode Island), Boston Logan (Massachusetts), and Bradley International (Connecticut). The Port of Davisville provides a unique option for businesses to move goods to and from their facility at the park. The Port had a record-breaking month in August 2018, importing over 35,000 vehicles, which broke the previous record by over 30%. The Port’s strategic location is one of many reasons that Quonset Business Park is an ideal location for companies looking to expand. The unprecedented 547% growth the Port has seen over the last 20 years is a testament to the hard work of the QDC team. Quonset welcomed two major companies to the Park in 2018, Finlays USA and Infinity Meat Solutions. These companies chose Quonset, in part, because of the access to world-class infrastructure. The mobility for importing and exporting products using the Park’s rail, road and sea infrastructure will set these companies up for success at Quonset. Finlays, a global leader in tea and coffee extracts, cut the ribbon on their new 28,800 s/f, state-of-the-art research and development center. The company has committed to hiring Rhode Islanders and maintaining these jobs in the state for a minimum of 12 years. Meanwhile, Infinity Meat Solutions, a subsidiary of Ahold Delhaize, the parent company of Stop and Shop, joined the Business Park in the fall of 2018. The new 200,000 s/f state-of-the- art protein packaging plant will bring 700 new jobs to the state. Quonset’s largest company, Electric Boat, also broke ground on a major expansion to their Quonset facility this past fall. The expansion will create and support 1,300 new jobs in Rhode Island. Quonset Development Corp. is focused on maintaining a business park that provides tenants with everything they need to thrive. The 200 plus companies that have made their home at Quonset benefit from the unique array of amenities that support their business goals and growth. We look forward to continuing to attract new businesses to the Park in 2019 and beyond.